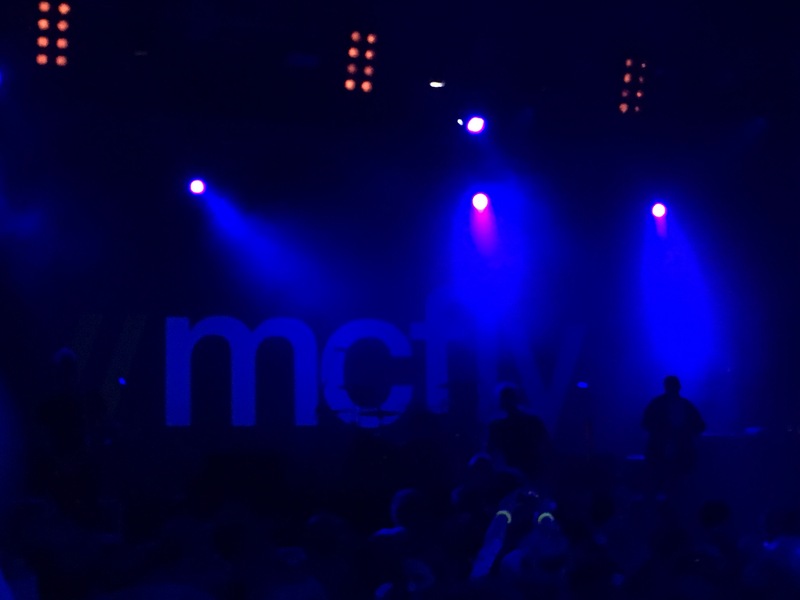 Last Friday night I went to a McFly concert. I know what you are probably thinking, a 42 year old chocoholic mum of six who likes to be in pyjamas by 6pm on a Friday isn&apos;t exactly their target audience. Very true. But Milly is obsessed with them. Obsessed. This stems from when they first burst onto the music scene 13 years ago and her big brothers and sister used to insist on listening to them nonstop. McFly were the soundtrack to years of school runs, and have a special place in our hearts as a result – even though for a long time I would always reply &apos;Anything but McFly!&apos; when we were debating what to listen to – they were my equivalent then to what the Frozen soundtrack is to most mums now! Aged 3 Milly would always ask for &apos;The Pizza Place Song&apos; (actually titled Surfer Babe) her very first song request, her very first favourite. I have to admit, I wasn&apos;t exactly thrilled about going. As far as I&apos;m concerned Friday nights are for getting into pyjamas, drinking wine and eating pasta (I&apos;m just so rock n roll!) so going to the O2 Academy with a bunch of screaming girls was not high on the agenda of Things To Do. But back in April when the tour was announced Milly was about to start GCSEs and to be honest, it seemed a great way of giving her a vision of Life After Exams. Something to look forward to when the hard slog was finally over, light at the end of the tunnel. Milly put a lot of pressure on herself to do well (the pressure was certainly not coming from me, all I asked was that she did her best) so for someone who suffers from anxiety Year 10 and Year 11 were tough. So even when the tour was announced as a bloody Anthology tour (three different shows across three nights in each venue – thanks McFly) I dutifully forked out for two tickets for each night in Birmingham. I wasn&apos;t actually planning on going though. At that point, her brother Matty was supposed to be going to at least two shows with her and a friend was going with her on the other night, but when the dates were changed after drummer Harry suffered a neck injury this wasn&apos;t possible anymore. Her friend could still go, her other brother Nathan could go to one night, but for the last night I was the only one free. The day arrived, and after a crazy couple of days at work I could hear the sofa calling my name, and I&apos;ll be honest I would have liked nothing more than to snuggle up with Mr Totsy for a night of wine, carbs and mindless tv. But instead I got quickly changed (into my going out uniform of jeans and a nice top, obviously) and we rushed to the train station. Straight away I realised I had been wrong to want to stay in. Spending time with my girl, just me and her, doesn&apos;t happen often enough and she is great company. So, I might not have been very familiar with the songs (it was the night they played their most recent albums, not the early ones which I know word for word!) I might have been too short to see much, I might have regretted the &apos;nice top&apos; as clapping my hands above my head was a bit restricted, my toes might have gone numb after standing all night (I have weird foot problems!) and it might have taken 24 hours for my hearing to get back to normal (I am painfully aware I sound like an actual pensioner at this point!) BUT the show was awesome and I had a great time. Milly was happy, so I was happy. And all us mums really want is happy kids. As we ran through Birmingham afterwards to catch our train (finishing with a sprint through the station – huge apologies to anyone in Grand Central that witnessed this spectacle) holding hands, pulling each other along and laughing our heads off, I realised how lucky I am. We are more than surviving the teenage years, she&apos;s not too ashamed to be seen out with me and we laugh a lot together. So I will take that! Tags: daughter, McFly, mum and daughter time, teenagers. Bookmark the permalink.